This summer’s hottest trend? Digital privacy. GDPR kicked down the door in late May, throwing Facebook and Google $8.8 billion in lawsuits within a day. As the summer progressed, we watched Zuckerberg squirm under society’s privacy-concerned microscope. And as we look to the fall, we’re about to see an even bigger shift: Safari’s newest update of intelligent tracking prevention, or ITP for short. This update would zap the ad industry’s easy access to personal data by applying machine-learning techniques to prevent third-party data collection between sites. Turning off the personal data faucet is going to make advertisers jobs a lot harder, especially considering the current practices of most ad targeting today. Almost all of the information that advertisers use to avoid the “spray and pray” model is based on personal data. Advertising tech company Criteo claims it could lose over 20% of its 2018 revenue if Safari follows through with its ITP plans. And that’s just one company that relies on this type of information. Whole segments of the ad industry have emerged out of both the supply and demand for personal data. When it comes to ad targeting, Facebook and Google’s advertising tools are a digital advertiser’s dream. But what will happen to advertising effectiveness when we’ve run the data well dry? Advertisers' next big move will be shifting focus away from the individual and over to the context in which the ad is placed on the internet. However, it’s not possible for humans to sift through all the webpages on the internet, read their contents, and gauge visitors’ intentions when viewing such sites though. The internet and its use is so vast that it becomes impossible to identify all the google searches made and websites visited when people try to find products like yours. But it is possible when AI and sophisticated data science is applied. Just as Safari uses machine learning to combat ad trackers, machine learning can now be leveraged to understand the contents of the internet and place ads on contextually relevant sites at scale. The DemandJump Traffic Cloud® actually scrapes the contents of websites, and layers this information on top of traffic flow data, to understand what kind of product ad a visitor of that website is most likely to click on. This application of AI empowers marketers to only place ads in front of people who would actually want to see your ad on that site. Sounds surprising, I know. But the results from our customers taking this advice speak for themselves. Let’s take a moment to assess how effective solely person-based targeting actually is. The average banner ad click-through rate is 0.06% - less than one percent. Meaning the other 99% of impressions were effectively lost on the internet, or made a significantly less measurable impact on the consumer. So, even if you know a specific audience is a good fit for your product, are you meeting them where they actually want to find you? When brands forget about putting their ads in the right context, and instead target audiences randomly all over the internet, consumers are inevitably viewing these ads when they're completely uninterested in the ad's content. Here's a question, when a consumer is served an ad for high-fashion clothing on a camping and outdoor site, are they in clothes-shopping mode? No, they're in camping mode. So are they really that likely to leave this site for a totally different train of thought? Nope. With GDPR and this new wave of privacy concern, advertisers no longer have such a personal data crutch to lean on. They're less likely to spend tons of money trying to impress one audience everywhere, and ruining this audience's internet experience with irrelevant content. Instead they'll have to look into the context of ads as discussed above. Luckily, meeting consumers where their intents align with your ad content is a way more effective way to advertise. Imagine if you could align your advertisements’ placement strictly to the path that internet goers follow to find products like yours. We call this the dynamic customer journey. In fact, we've even found that identifying and advertising on these touchpoints regularly increases ROAS by over 200%. Identify the dynamic customer journey, the sites that consumers visit when they might be interested in a product like yours. Great ad placement is all about discovering people’s intentions when they navigate the internet. This includes uncovering the google searches made to discover your products, and and all the internet locations consumers visited that led them to your store (or your competitors) - then speaking to consumers then and there. People discover the need to buy products differently. If you can identify that path of websites, and speak to your would-be customers with relevant content to them in that moment - that's good ad placement. DemandJump’s Traffic Cloud® identifies these paths by intelligently analyzing the internet’s contents, and identifying the best websites to naturally funnel customers to your product page. Personal data is a marketer's crutch. The hard part of digital advertising is identifying the sites where consumers actually want to see your ads, where click-throughs are guaranteed. So I say, all GDPR does is force marketers to walk again. Even further, identifying the path to purchase is advertisers’ new hope for marketing without personal data. As a company that helps marketers optimize their digital spend, we’re actually excited for this wave of privacy concern. We’ve already shifted our focus away from personal data and over to making sense of the internet - and we are ready for others to join in. 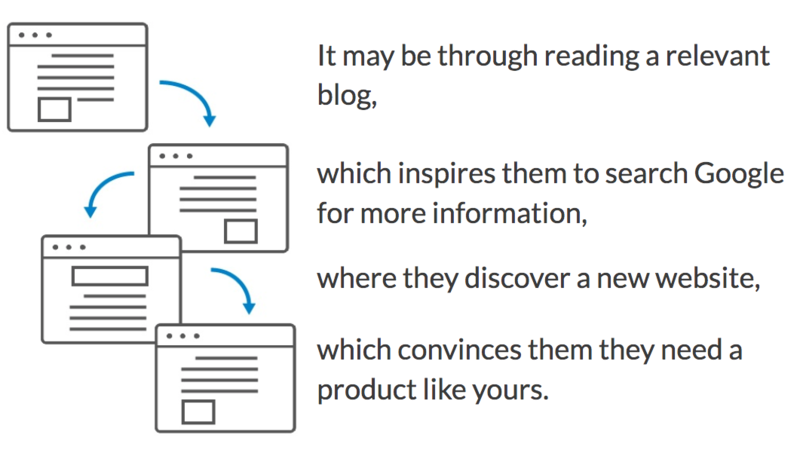 DemandJump’s recommendations and insights don’t rely on cookies, or any personal data for that matter. Our software doesn’t care about some guy from Portland’s Facebook likes. All it cares about is delivering effective ads - when and where consumers are looking for them. Curious to get a better picture of this kind of advertising? Reach out to chat about your customer's path to purchase or see a demo of our platform.